Two-factor authentication is basically a process that one sets up to enhance the security of online accounts and requires more than one piece of in order to access them. Our online accounts contain a lot of information – from our personal to financial to medical, therefore, securing them is a must. We do keep hearing stories of online accounts getting stolen or hacked, so we should look for out for a way that can keep them secure. The only way we’re talking about right now is two-factor authentication. It’s a simple, powerful method to keep our online accounts safe and secure. Factor basically means a piece of information that only you have. Most of the online accounts require you to log in with only one factor which is your password. Though by entering just one factor (your password) you can access your account quite quickly and easily, it also allows anyone having your password or someone trying to guess it can easily access your account too. To stop this from happening, you need two-factor authentication because it comes with two pieces of information to log into an account. Mostly the first factor is your password whereas the second is often a PIN code. When you’re using an iPhone, your Apple ID would perhaps be the most important online account for you. Apart from containing your personal information as well as credit card details, it also other significant information such as your email, contacts, photos, text messages, calendars, and lot more. Any person having control of your Apple ID account could access all of this important information of yours. 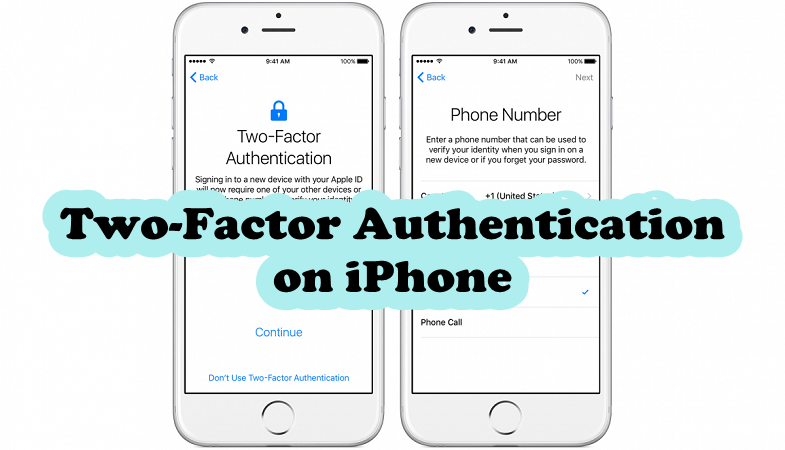 Therefore, it’s necessary to set up two-factor authentication on your iPhone. When you secure your Apple ID account with this powerful security method, only the devices that have been designated as ‘trusted’ will be able to access the account. This means that a hacker or any other person won’t be able to access your Apple ID unless they are also using any of your iOS device – iPhone, iPod, or Mac. Two-factor authentication makes your Apple ID pretty secure. Step 2: If you’re running the iOS 10.3 or higher version, then simply tap your name at the top of your phone screen and head over to Step 4. Step 3: In case you’re running the iOS 10.2 or earlier version on your iPhone, then tap iCloud and open your Apple ID. Step 5: Now, you will be required to Tap Turn on Two-Factor Authentication. Step 6: After doing that, simply tap Continue to move to the next step. Step 7: When you tap Continue, you will be asked to enter your phone number. Now choose a trusted phone number that is only within your reach. This is the same number on which Apple is going to send your two-factor authentication code during set up as well as in the future. Step 8: You can either choose to get a text message or a phone call with the code. Step 9: Tap Next to move on. Step 10: Now you will enter the six-digit code. Step 11: Once Apple’s servers verify that the code is correct, two-factor authentication will be enabled on your Apple ID.